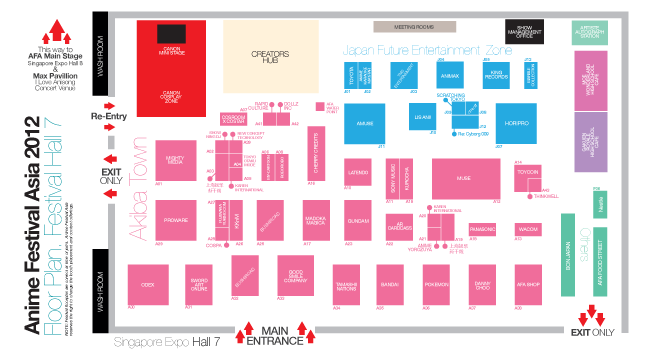 THE AFA12 MAIN STAGE WILL BE AT HALL 8 OF SINGAPORE EXPO! As one of Japan's largest talent management agencies, Amuse Inc. will showcase the very best that they have to offer, including Perfume, BABYMETAL, FLOW and the Samurai X live-action movie! King Records will be presenting one of this season's most anticipated hits on the AFA Main Stage, featuring a screening, a discussion with the show's producer, Go Nakanishi, and a cosplay competition, judged by KANAME☆! fripSide and m.o.v.e., performing on Saturday night at the Max Pavilion Concert Hall, will appear on the main stage to greet their fans before the big concert! We are proud to announce that HoriPro will be bringing to fans their own featured talents at AFA12, including performing stalwart May'n, local talents Sea☆A and the talented Daisuke Kishio! The man behind "Macross Plus" and "Cowboy Bebop" has proven the importance of music and the role it plays. Shinichiro Watanabe will share his visions and insights. with the audience only at the AFA Day Stage! LiSA, performing on Saturday night at the Max Pavilion Concert Hall, will appear on the main stage to greet their fans before the big concert! As the sequel to one of 2005's most loved anime, "Eureka 7 AO" has lived up to the expectations of many fans. Two of the show's producers, Masahiko Minami (BONES) and Motoki Mukaichi (Bandai Visual), will bring to audience what it was like to realize a show of "Eureka 7 AO's" proportions. Catch the best individual cosplayers at AFA12 as they compete to be the best at AFA12! "Road to Ninja" is the ninth "Naruto" movie to be released since the series first started airing ten years ago and this screening will be part of the AFA Main segment activities! In order to access all these content, you will need to purchase a Festival + Stage ticket for 10.11.12 (SAT) at $20. He is one of Japan's up and coming animation directors and is behind "Eden of the East" and the upcoming "009 RE:CYBORG". He will share the audience his experiences in creating these hits! Fumiaki Nishihara, the editor-in-chief of Lis Ani! magazine, will introduce to the audience all about magazine, as well as the various activities that the magazine is involved in as well! Catch the special appearance of Aimi, voice of Suiko of Ultra Rare from Cardfight!! Vanguard, live on stage and join the sneak preview of a new upcoming anime title, only at AFA 12 Day Stage. May'n, Minami Kuribayashi, Sea☆A and Sphere, performing on Sunday night at the Max Pavilion Concert Hall will appear on the main stage to greet their fans before the big concert! The four members of Sphere, Minako Kotobuki, Ayahi Takagaki, Haruka Tomatsu, and Aki Toyosaki, will take over the AFA main stage for an exclusive segment featuring Q&A and live-dubbing sessions! Our event's MC will bring to the audience what he has been up to in the past year, since he last stepped on our shores! The best cosplay teams from Malaysia, Thailand, Singapore, Indonesia and the Phillippines will gather in AFA12 and prove which country has the mettle to take home the title of the region's best! The movie to this hit manga and anime series will be part of the Main Stage activities at AFA! © Hiro Mashima / KODANSHA, Fairy Tail Movie Production Guild. All Rights Reserved. 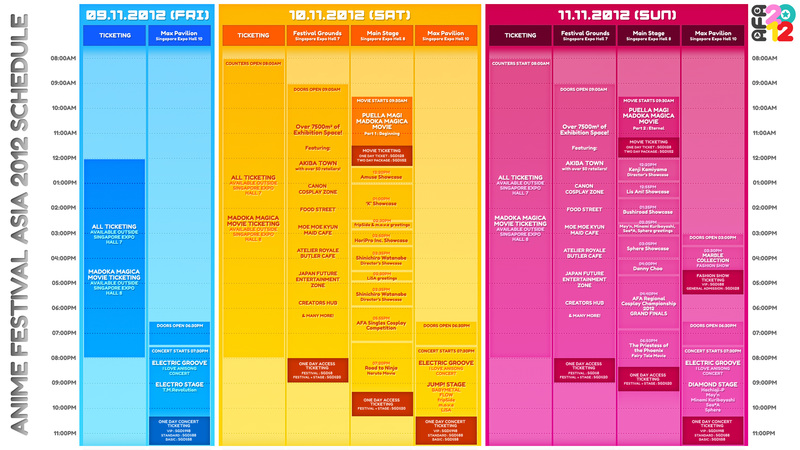 In order to access all these content, you will need to purchase a Festival + Stage ticket for 11.11.12 (SUN) at $20. NOTE: Festival floor map is not drawn to scale. booth placement and content offerings.